After the very late night yesterday we decided to make a leisurely start to the morning, planning arrival at Dorney Park about an hour after opening. As luck would have it, though, it was closer to noon when we arrived, largely because satnav had problems getting us through Philadelphia. The problem was caused by the voice directions, which say useful things like turn left or turn right. Unfortunately, this doesn't help when you have two left turns within three hundred feet of each other, as you will invariably get a different one to the one the computer wanted. The word recalculating was repeated over and over and over again, each time supplemented by a catalogue of colourful metaphors from both of us. If anyone from Garmin is reading this, perhaps your next update could improve this by saying something like take second left? After my last experience in a Cedar Fair park it is fair to say that I wasn't overly enthusiastic about visiting this one. There were several coasters I particularly wanted to ride, but it was touch and go as to whether this was worth the corporate annoyances that the aforementioned chain brings. 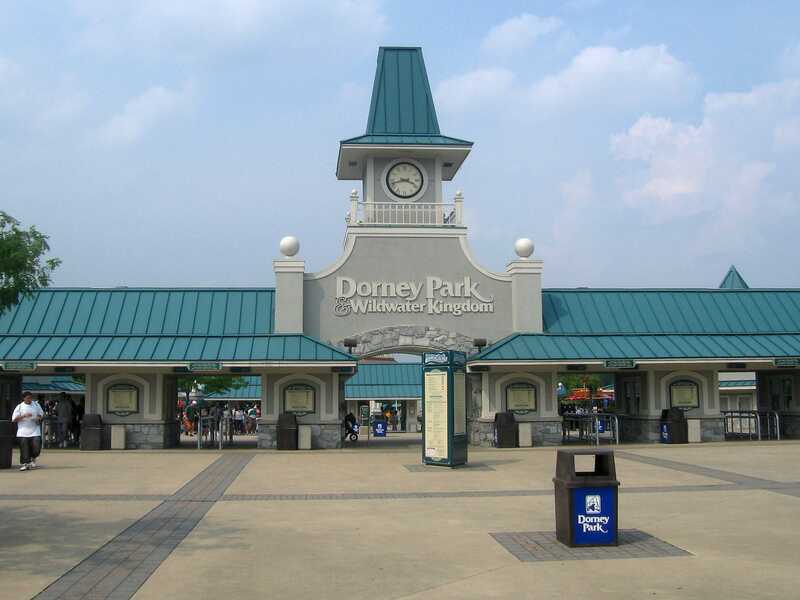 To my delight, however, there was almost no sign of this whatsoever in Dorney Park, and it is no exaggeration to say that one day here has marked it as one of my favourite parks in the United States. We started our morning with Talon (#800), a rather good inverted coaster that towers over the front gate of the park. The music being played in the queue line was about three times louder than it should have been, but fortunately we didn't have to listen to it for any longer than it took to walk around the edge of the large cattle pen. Two train operation left us with a wait time of precisely zero minutes for the back row, which made for a great start to the day. In fact, the only ride with any queue to speak of during our visit was the Wild Mouse (#801). An unusual loading policy was in force, restricting the cars to a maximum of two adults per vehicle. This resulted in us being asked to board before a middle aged gent who had been in front of us in line, much to his consternation. His loud grumbling drew a polite apology, impressive really; I'd have been inclined to tell him to grow up - with such a slow loading ride the ideal is to fill every car, leaving no empty seats, and the staff were doing this to the best of their ability. For whatever reason a maximum of two cars were allowed on course at a time, making me question why six ride operators were necessary; but I'm just an enthusiast, so what do I know? Hydra the Revenge (#802) was another nice coaster, and the inversion before the lift hill was a nice touch. Having said that, however, there was some very distinctive and unpleasant vibration in the edge seats on the train, which drastically limited rerideability, and is unforgivable on an almost new B&M. Perhaps we hit the ride on a bad day, but if not, the park should probably look at this one, as it cannot be doing the trains any good. There was one amusing feature of the ride which deserves documentation. We all know that the United States of America features the occasional person with limited formal education. Furthermore, we know that the occasional citizen of the United States feels compelled to handle their ineptitude by means of the legal system. 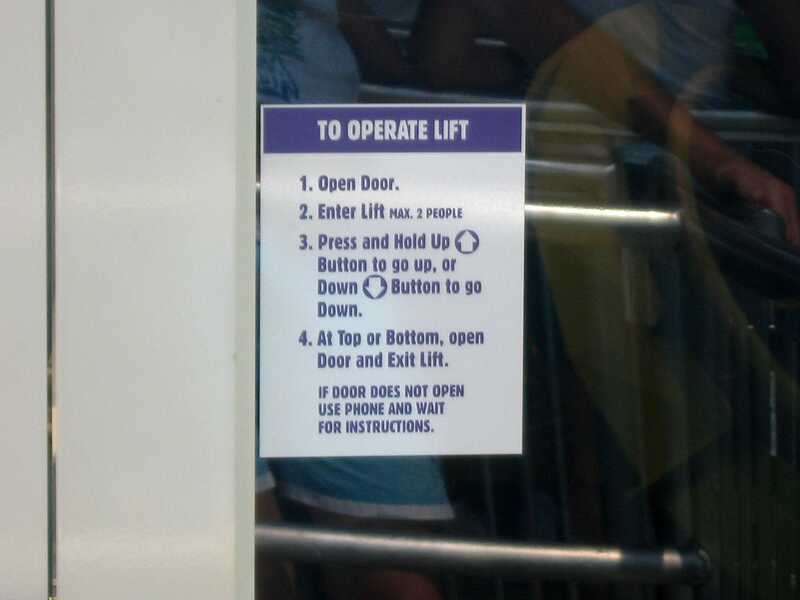 Nevertheless, surely even the average American understands the procedure for operating a lift. Just in case you are the exception, however, Dorney Park has you covered. One of the things that never ceases to amaze me is how rough some kiddie coasters can be. Woodstock's Express (#803) was extremely violent, throwing riders from side to side in a manner that was altogether not comfortable. It was on this ride that we hit the sole instance of silly rules in the park; although we could only have one adult per car, that adult had to have both legs on the same side of the lap bar, making for a very tight squeeze. Perversely, this requirement made me less secure than sitting in the middle of the car, and all it really achieved was to slam my left knee into the bar at every corner. The experience from designs such as this one is in my view more likely to put children off coasters than encourage them to try the bigger ones, which is unfortunate to say the least. The park is home to a classic Schwarzkopf design, and though I had been aware of this it had somehow had slipped my mind. To that end, it was exceptionally pleasant to find that Laser (#804) has not been vandalised with new restraints or seat belts or anything else like that; it was running just as it did when it left the factory, which is to say very well indeed. It is a testament to the greatness of Anton Schwarzkopf that the oldest steel coaster in the park runs just as well (if not better) than some of the newer ones. A quick spin on the powered Dragon Coaster led us to the largest ride in the park, the Morgan-built Steel Force (#805). In terms of experience the coaster was as near as matters identical to Mamba, both in layout and in location, right down the side of the park. Looking to one side provided a fantastic overview of the park, and to the other a somewhat less impressive high rise view of a car park. Our timing, as it happened, was as close to flawless as you can get; the ride went down with technical difficulties just as our train pulled back into the station. 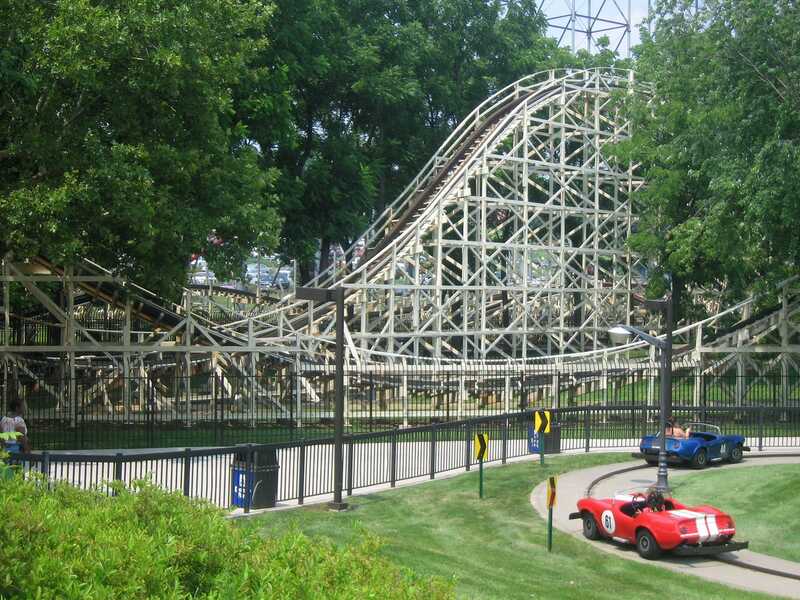 That left Thunderhawk (#806) as our last stop, a classic PTC wooden coaster that was running very well. The ride features a trim brake towards the end that appears to have been a recent addition, which loses the ride a few points in my book. At the same time, however, it is easy to see why it is there; the final two hills would probably have launched riders into orbit without it. At this point, we had completed all the rides on our hit list with two more hours time allotted to the park. This allowed us to re-ride four of the better coasters, as well as take a spin on the Ferris Wheel for some overview photographs. We thought initially that the latter might be closed, as there was no sign of motion on it and hadn't been in a while, but there were three operators sitting there waiting around for guests to arrive. It was a shame to disturb their lengthy break, but who knows; maybe they appreciated us alleviating the boredom for them. Sometimes one cannot help but wonder how an amusement park sprouted up in a particular location. The obvious example for the European reader is Alton Towers, which can only be reached by means of small twisted roads that a coach can barely make it through. Knoebels Amusement Resort is the American equivalent of this, with roads that would not be out of place in the west of Ireland. It looked initially like satnav was attempting to take a shortcut across the countryside, but subsequent investigation has revealed the truth; there is no good way to get to the park; it really is in the middle of nowhere. Even though it may be difficult to get to, however, every self respecting coaster enthusiast should make the effort. The reason is simple; it is home to two of the best wooden coasters out there, Twister (#807) and Phoenix (#808). Both of these rides are truly stunning both in their track work, which has been well looked after, and in their operational efficiency. They operate with simple restraints; lap bars on the former and a buzz bar on the latter. The enthusiastic staff, coupled with the absence of unnecessary seat belts, results in dispatch times on both rides of twenty seconds or so, previously seen only in German fairgrounds. 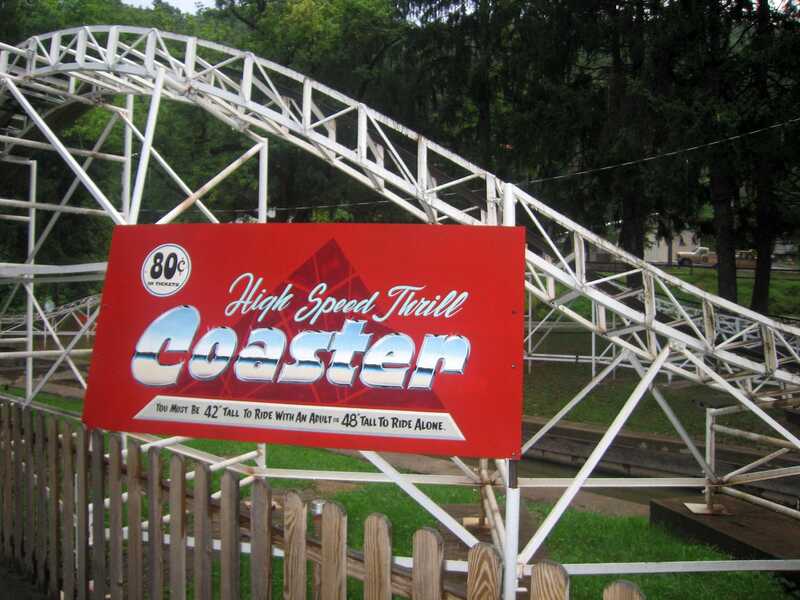 An honourable mention should also to go the High Speed Thrill Coaster (#809). Though superficially a kiddie coaster, it is a ride built for the future coaster enthusiast without a doubt. The lift hill is powered by a tractor engine converted to run on propane, which adds an additional flavour to the whole home-spun nature of the park. This also allows the lift to run faster for the second and third lap of each ride. The net result from this is that the design gives more air time than many adult coasters, and its restraint design allows all passengers to experience this in full. The staff member in the ticket office made fun of us for wanting to ride this, but in all honesty I cannot see why; no visitor to the park should miss this stunning little coaster! In addition to the three superb coasters, we tried a very good Haunted House, with high quality scenery and several moments that made both of us jump. A full review and detailed description of the place is available on the DAFE web site, though beware, as it contains spoilers. My only regret from the visit was that the upcoming Flying Turns ride was as yet unfinished. We were able to see how construction is progressing, and if the existing coasters are anything to go by this will be a fantastic ride too. It will provide an excellent reason to return, as if one were necessary.